The mid-Atlantic region of the US is supposed to be getting a hard winter, but for the most part, we’ve only seen flurries so far this year. There is no white Christmas on the way either. Mind you, I’m not complaining. 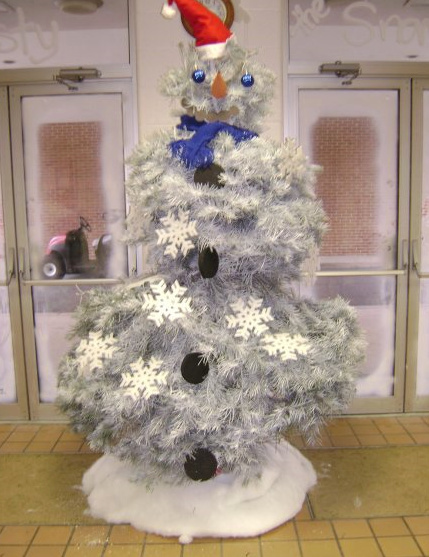 Though I’m not a huge fan of snow, I have been enamored with the idea of making a snowman out of a Christmas tree ever since I saw students make one on campus several years ago, which is still the winner in my book. 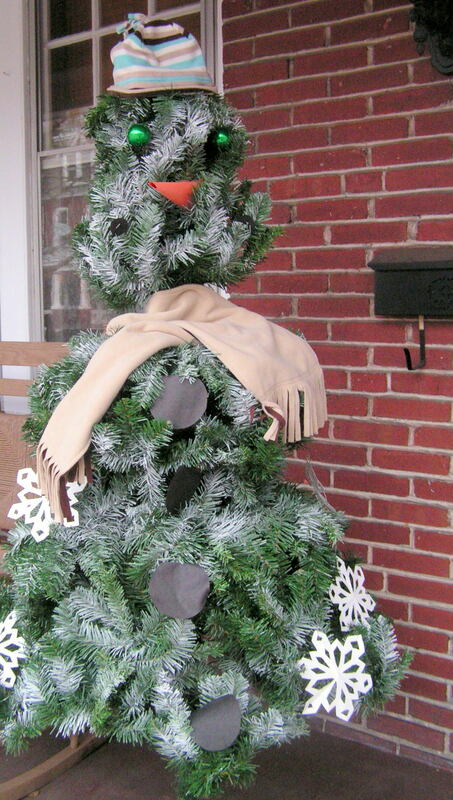 Using this tree as inspiration and a little nudge from Pinterest, I decided to put together a snowman for the front porch. I already had the tree because my mom had snagged a cheap tree on clearance for me a few years ago. I know a few blog posts ago, I sang the praises of fake trees, but this one would not be allowed in my house. However, it served the purpose nicely for this project. Once I got the branches on the tree, I started to shape it. The tree had five layers plus a top section. I bent the entire top section into a ball for the snowman’s head. Then, the first and second layers were bent into each other to form the next section of the snowman. And, layers three through five were shaped into the base. That layer was the toughest. I think working with a cheap tree was the factor making the creation so tricky since there wasn’t much to work with. Each branch had to be shaped just so to avoid bald spots. I also had to borrow some branches from layers 2 and three to fill the gap between the middle section and the bottom section since there would not be a scarf closing the gap. At this point, I bet the neighbors were thinking I was going crazy. And, if they hadn’t yet, I decided to pull out some spray snow. I figured that would either tip them off about the project or tip them over the edge into thinking I really had lost my mind. Next year, I’ll be more generous with the spray snow. This was one can’s worth of coverage, and I think I should use at least one and a half cans next year or maybe go for the gusto with two. I ran out of time and daylight, so the project wound up sitting on the porch like this for a day or two. I’m sure the neighbors were impressed. Then, I got around to making a construction paper nose, mouth, and buttons. I downloaded some paper snowflake patterns and hacked through the folded cardstock the best I could. And, I gathered a scarf, hat, and ornaments for the eyes. And, there he was. My all weather porch snowman. There have been a few times when I’ve forgotten that the snowman is on the porch. I’ve had a few heart palpitations when I’ve caught a glimpse of the snowman out of the corner of my eye and have momentarily thought that a rotund, short man is about to break in. This entry was posted in decorating, that's life and tagged christmas. Bookmark the permalink. You are amazing and crafty. But I think that this snowman looks a little like a serial killer. No offense. 🙂 Yes, more spray snow. I wonder if he creeped out the mailman just a bit.